I was an account executive, cold calling local business in Tampa, Flordia. SO, if you ever worked at or owned a small business in Tampa, I’m sure you’d be familiar with the thousand of times Yelp reps call in (early morning or after rush hours). My first sale was with an Asian Cuisine and it only took me 3 calls to close. After a few sales, my interest was sparked. I grow more and more interested in the marketing needs of small business and entrepreneurs. This was definitely, one of my biggest accomplishments because ever since I was a little girl, I’ve always wanted to work for a Fortune Five tech company. My first actual choice was working for Google, but that seems so far fetched because of their extensive interview process. I interviewed at LinkedIn but all I got was “Your too focused on social media and this is more of a sales job”, as if sales had nothing to do with social media… Yea right. After two months of working for YELP, I found my true passion for helping small businesses and individuals with their social media needs. With talking to thousands of small business owners about their business needs, I knew that there had to be an easier alternative to helping businesses manage their social media. I tried my luck! I landed my first client through INSTAGRAM. She was a Make-up artist looking for more clientele in New Jersey. 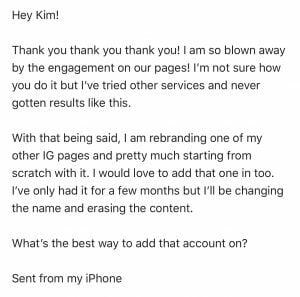 I was eager to help her increase her chances of attracting more potential customers through social media, so after a few exchanges, she finally allowed me to manage her social media. After working with her for a month, she increased her social media visibility by 100% and was also featured on @MACcosmetics, and this was two years ago. Ever since then, I knew that I wanted to help people increase their online presence. Fast forward two years, I’ve built a team and have worked with over 1000 different individuals and brands. Here’s an email that I received that really warmed my heart! We yearn for emails like this and we welcome your feedback! If you have a cool or interesting testimonial or story to share about your experience working with us, we’ll give you one free service that will become active on your next month. For those who haven’t joined our family, you’ll get 30% OFF YOUR FIRST MONTH! Thanks again for being apart of the Social Hackettes Family and we will soon be sending WEEKLY Social Media FREEBIES straight to your inbox STARTING FEB 1st!